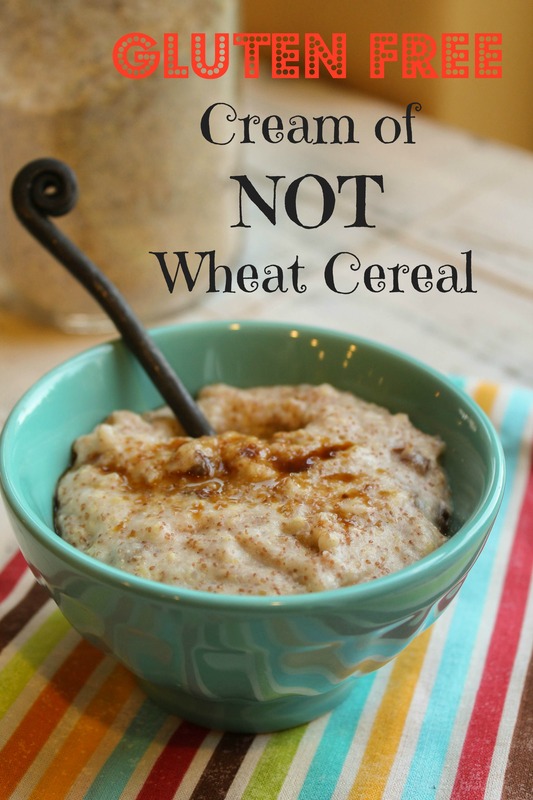 When you go gluten free and you miss ‘Cream of Wheat,’ there is STILL an option!! Gluten free cream of wheat is my creative spin on this classic breakfast hot cereal of my youth! I finally figured it out. I have made several gluten free hot cereals…but none closely resembled the cream of wheat I remember so fondly from my youth. Then we figured out that oats were out too (grrr!! ), and so a favorite breakfast was removed for two of my kiddos. Beyond frustrating. In a very annoyed moment, I set about to make some sort of hot cereal for my son. I grabbed a bit of some the things I had on hand, and cooked it up. 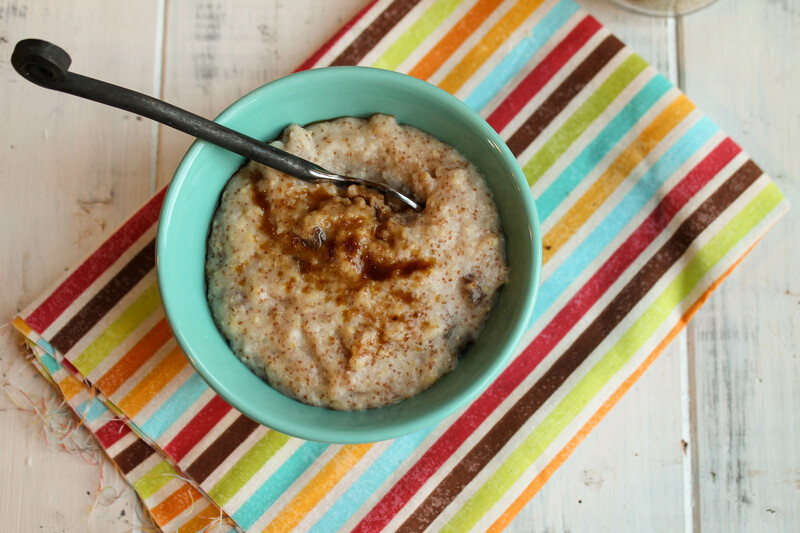 The results are the closest thing to Cream of Wheat I have tasted since going gluten free. Take some time to track these ingredients down, I have linked to my sources for you. 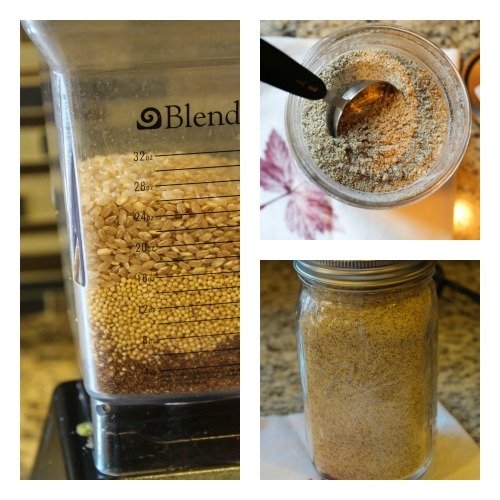 Coincidentally, I use these same whole grains for our favorite Soaked Teff Bread, so you can try THAT recipe too! In a small saucepan, whisk together the remaining ingredients along with the pulverized grains. Bring to a simmer over medium low heat, stirring frequently so there are no lumps. The cereal will begin to cook and thicken. Length of time you cook is based on your preference, but about 10-15 minutes is needed. The cereal DOES thicken a bit as it cools. If you pre grind all the ingredients to make a big batch, how much do you use to cook one serving? 1/2 cup for 2 cups liquid Carol, great question!! Sometimes gluten free is so hard, I’m glad you found something that is close to cream of wheat. We’re not gluten free but I think we’re going to try this just to try some different grains! Thanks so much for sharing with us at Simple Lives Thursday; hope to see you again this week. 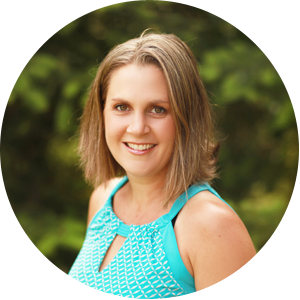 Angi @ SchneiderPeeps recently posted…What are fermented foods, anyway? It’s definitely the perfect time year to give this a try! Thanks for sharing it at Savoring Saturdays, Tessa! This is delicious! I am enjoying it now with bananas and some brown sugar. Yay Donna, thanks for giving your feedback! Wow this looks delicious,& ver hearty. I have wanted another type of hot cereal besides brown rice. My son can’t eat oatmeal, corn,or buckwheat. I know buckwheat is gf but he still can’t eat it. I would love to make this, thank you! This looks so nice! Oats are out for me too, and I’ve just accepted the fact creamy rice is the only creamy hot porridge I can have… I haven’t tried mixing grains though. I’ll definitely be giving it a try next time. Thanks! I use to eat cream of wheat as a kid, but really love cocoa wheat. Hmm now you got me thinking, might have to try an experiment of my own. Thanks for sharing on Real Food Fridays, new party going on now. Just this morning I was thinking I wonder if I could grind teff and make a hot cereal with it. I have made cream of millet, I have made cream of short brown rice but I LOVE the idea and never would have thought of it myself to blend these together. This sound perfect. Will try!!! Can’t wait to hear what you think Mary!! Sounds delicious especially if you add the coconut butter and raisins and all gluten free. Thanks for sharing on Real Food Fridays Blog Hop! A great trick, to enhance the flavors, is to toast the grains (particularly the brown rice) in a dry skillet before grinding. I’ve made a lot of different cereals for my kiddos when I was making baby food. It was always so good that the whole family would eat it. Just toast until lightly brown and aromatic. That IS a great idea Brooke…I do that with my millet porridge recipe, but hadn’t thought to do that with this yet! Thanks Brooke! Brilliant!! Your creative kitchen triumphs never cease to amaze! Thanks Julia…necessity is the mother of invention! This recipe looks fabulous, what a great way to start the day! Looks great! How would you modify it to soak the grains overnight? Hi AMy! I have been thinking of trying that very thing! You could try soaking in the cooking liquid..likely the simmer time will be reduced and you may need to add more liquid to get the texture you’re looking for. Let me know if you try it! I often use buckwheat as a cream of what sub. I cook it with coconut sugar and coconut milk. Do you ever use buckwheat for hot cereals? I love raw buckwheat groats..I bet they would be a tasty addition to this Amber! Will try it! I want to try soaking the whole mixture too, and buckwheat is high in phytase too, will help break that brown rice down! I was just thinking and wondering about how to soak this. Please post an update when you get it figured out. I’ll post if I make it that way with success too. I am so excited to see this! 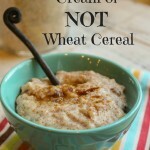 I used to LOVE Cream of Wheat! 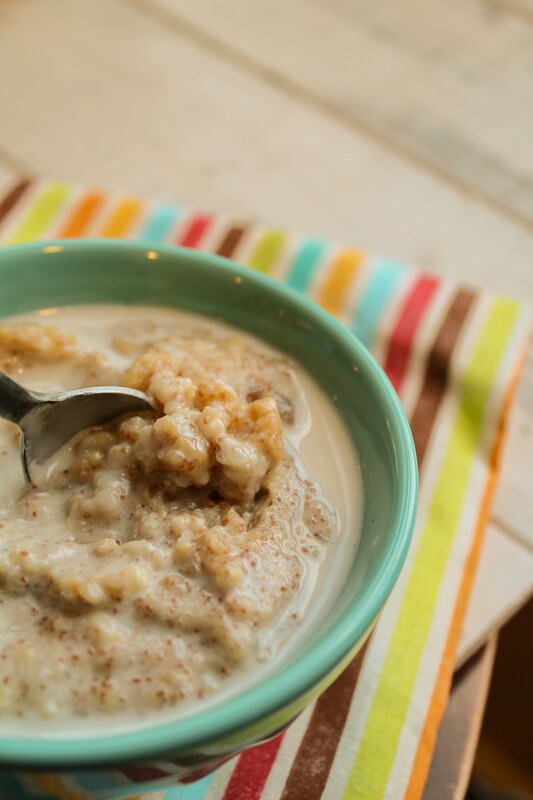 We’re not exactly gluten-free around here… but a big bowl of wheat gluten does NOT make a healthy start to the morning! This, on the other hand, does! Looks yummy, what a great idea! -I love that spoon!!!! good ole Cost Plus Cassidy!